As the latest round of talks between driver representatives and cab-aggregators failed, drivers associated with taxi-hailing companies Ola and Uber have launched a fresh round of agitation in Bangalore. One of the protesters attempted suicide outside Ola office by consuming poison. He has been rushed to hospital and is being treated at the ICU at Manipal Hospital. Around 2,000 protestors assembled before Vidhan Soudha, the state legislature building, in the morning and later moved to Ola office at Old Airport Road. One of the protesting members told Techcircle.in that the person who attempted suicide is an Ola driver. However, this could not be immediately verified. The protest was planned after a meeting called by the state transport ministry on Wednesday failed to make any progress. Uber representatives abstained from the meeting while Ola asked for 15 more days to address the issues raised by the agitators, a person present at the meeting said. Additional Transport Commissioner H G Kumar presided over the meeting. The previous meetings were called by Karnataka State Transport Commissioner MK Aiyappa. 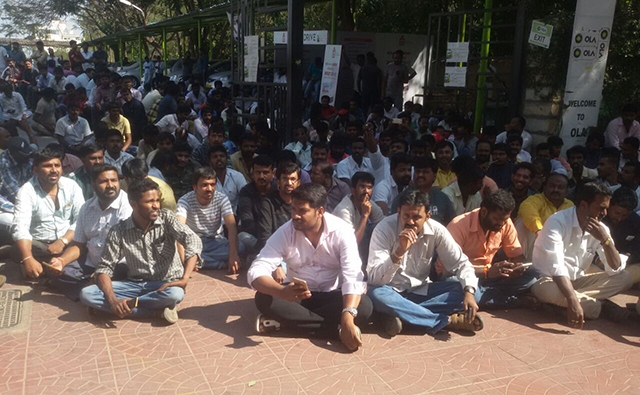 “We have met with them thrice now, but they haven’t addressed even a single demand by the drivers. All they do is buy more time on every occasion,” he said. More unions are likely to extend their support to the protest from Friday. Email queries sent to Ola and Uber, on how they plan to address the situation, did not immediately elicit a response. The protesters demand that both Ola and Uber should adhere to Karnataka On-Demand Transportation Technology Aggregators Rules, 2016 that fixed taxi fares at Rs 19.50 per kilometre (for AC cabs) and Rs 14.50 per kilometre for (non-AC cabs). Currently, the cab aggregators offer deep discounts to offer rides at minimum charge of Rs 6 per kilometre. The protesters believe that they would be able to earn decent incentives if the operators start adhering to fares fixed by the government. Agitators also want Ola and Uber to stop attaching new cabs as existing drivers are finding it difficult to secure enough bookings. Besides, they want the taxi operators to immediately stop penalising drivers based on customer ratings. “If the driver doesn’t allow a customer to smoke inside the cab, he would give a low rating for the driver on the app. The cab company would then penalise the driver with Rs 1,000 fine for bad behaviour,” one of the protesting drivers said. “They say the cab-sharing service is for a green city cause. They do not have a single compressed natural gas (CNG) vehicle in the city, and they are aggressively advertising and adding more cars to their network. This shows how shallow their argument is,” he said. Taxi-hailing services of Ola and Uber were partially affected on Wednesday too due to a strike called by various unions protesting against a recent hike in driving licence and other fees by the Regional Transport Office (RTO) in addition to the flexible fare structure followed by cab aggregators and falling income of drivers associated with them. Tanveer Pasha, president of Ola, TaxiForSure and Uber (OTU) Drivers' and Owners’ Union, said that various unions from Delhi, Kolkata, Mumbai, Hyderabad, Bangalore, and Chennai are working together to call for a nationwide strike if their demand are not addressed. Meanwhile, the indefinite strike called by drivers of Uber and Ola in the national capital region has entered the seventh day on Thursday. The Delhi government is likely to arrange a meeting between protesters and taxi operators to break the deadlock. The protest got out of control on Monday, with drivers gathering around Ola's offices in Delhi. A person aware of the development told Techcircle that after protests flared up at one of its offices, the cab-hailing company, in a pre-emptive move, ensured that its staff, across offices, left for home earlier than usual.